Hearing Assistance Devices (also known as Assistive Listening Devices or ALDs) help you hear better. They amplify the sound of people's voices and some can be used for watching TV, listening to music, and more! We carry ALDs for small and large venues, as well as for language interpretation. 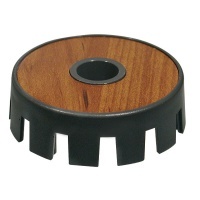 The TM-10 conference table microphone adapter adds a whole new dimension to the versatile AT-216 personal assistive listening system. Simply inserting the clip-on lapel microphone included with the AT-216 into the TM-10 transforms the microphone into a table-top conference microphone, adding even more functionality to the system. Using the TM-10 allows the microphone to function as an acoustically tailored boundary-type microphone by using the reflective surface of a table or desk as the boundary area that the microphone picks up. This allows the user to hear everyone sitting around the table, eliminating the need to pass around a microphone. The TM-10 has been specially designed to maximize the high fidelity performance of the AT-216 personal assistive listening system by emphasizing the frequencies that enhance speech clarity. 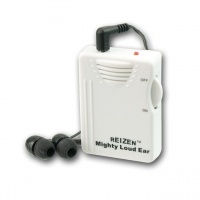 The Reizen Mighty Loud Ear 120dB Personal Sound Amplifier for the hearing impaired is a powerful amplification device with a built-in microphone for clear and loud delivery of voice and sound through the dual earphone. Loudness is user controlled with the variable volume control dial, which also serves as the on/off switch. The red LED on top of the unit glows when turned on. 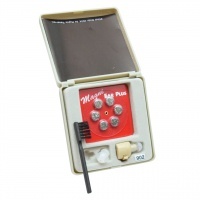 This lightweight, compact, personal hearing amplifier can pick up sounds at a distance up to 100 feet away. 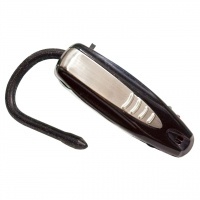 Handy built-in belt clip allows you to attach it to your belt, shirt pocket, or clothing. Includes 2 AAA batteries and dual earphone. Additional earphones are available to use as spares or replacements. Dimensions (LxWxH): 1.75in. x 0.75 in. x 2.50 in. Caution: This product is not water-resistant. Please Note: This is not a medical device. For hearing problems, please consult a physician. Perfect for hunters wanting to hear every sound, or anyone who appreciates the rugged, stylish camouflage look plus the functionality of a powerful amplification system! The Stealth SSA Predator is a high performance, affordable and discreet sound amplification system. 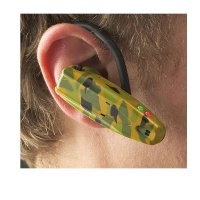 Designed to look like an expensive cell phone earpiece with a unique camouflage finish, it will allow you to stalk and listen for your game. Never again will a big buck sneak up to your position, walk out, or around you without you hearing him. When fully charged the Stealth SSA Predator lasts all day. The Stealth SSA Predator can be worn in the right or left ear to give you a perfect fit. Whether you're in the field, forest, game stand, watching TV, listening to soft music, or just having a quiet conversation you will hear everything. Say "Goodbye!" to the frustration that comes with not being able to hear the big one and letting him get away! Say Hello to the Stealth SSA Predator. - Ultra lightweight at only 0.6 oz. Product Box Measurements: 5.25 in. x 4.625 in. x 2.375 in. Product Weight (amplifier, eartips & AC charger): 6.1 oz.